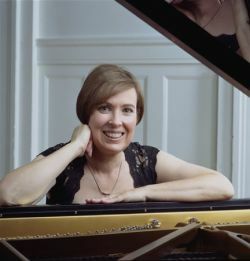 Described by the Chicago Sun-Times as "one of the finest chamber pianists on the scene, …playing with her ears as much as her gifted hands," pianist DIANA SCHMÜCK has appeared in concert throughout the United States and Canada, in Europe and as far as the Philippines, where she was a soloist with the Metro-Manila Symphony. She has performed as a soloist at Chicago’s major venues, including Symphony Center, Ravinia, WFMT, and the Chicago Cultural Center. A founding member of the Orion Ensemble, Dr. Schmück also founded a trio of other chamber groups: the Debriana Duo piano team (with Debra Sutter), which received special recognition at the first Murray Dranoff Duo-Piano Competition and was invited to perform at the American Liszt Society in Washington, D.C.; the Daedalus Duo (with clarinetist Bonnie Campbell) and Vermillion (with Bonnie Campbell and Judy Stone). She also collaborates with instrumental musicians from many of the foremost American orchestras and worked for fourteen summers with world-class singers at Ravinia’s Steans Institute. In the summer of 2007 she performed with Vermillion at the International Clarinet Association’s ClarinetFest in Vancouver (BC), where she also had the opportunity to collaborate with celebrated clarinetists David Shifrin and Richard Stolzman. Diana is a doctoral graduate of Northwestern University and also holds degrees from DePaul University and Wheaton College. Having taught and coached in several university, college, outreach, and summer festival settings, she currently maintains a studio in Evanston.